This post has been a long time in the making, folks. I’ve been wanting to do a feature on Provo, Utah, where I’ve now lived for three years, but as you know, it takes awhile to feel situated and like you’ve been able to experience a lot in your town. I’m a terrible social planner. But I know you’ve been on the edge of your seat waiting for it to come out, so so sit back, it’s time to explore everyone’s top bucket list location, Provo, Utah. 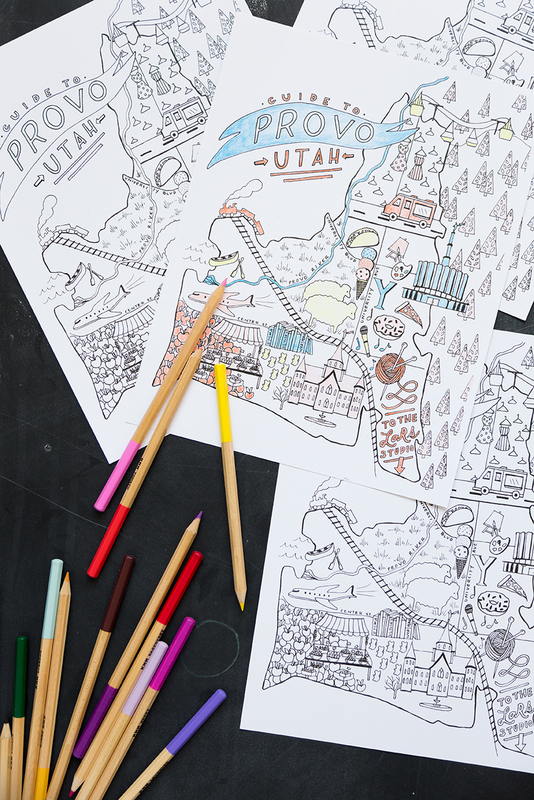 AND, good news, while you’re traveling to get here, you can color it in with this handy dandy coloring page, free to download. I first lived in Provo as a student over 15 years ago and it has changed so much! Back then I didn’t have a car so I didn’t really know what I was missing out on, but even in the three years we’ve now lived here, it’s changed dramatically. There’s a horde of tech companies moving here as well as company headquarters and offices as well as a thriving music, art, and social media influencer scene. Ha! I don’t know if that’s the proper term for it, but I don’t know how else to phrase the YouTubers and bloggers who reside or have come out of Provo or Utah in general. For some reason, there are a LOT! Provo is a popular destination for Mormons, and being Mormon, I often get asked where to eat, where to stay, what to do. I also find that a lot of people from the North take the Utah I-15 route to go South to see Utah’s great national parks: Bryce, Zion, Arches to name a few. Utah is a gorgeous state and there’s a lot to see, especially if you love nature. I love looking at nature, but admittedly, I’m not the biggest nature go-getter. I prefer to mosey really. 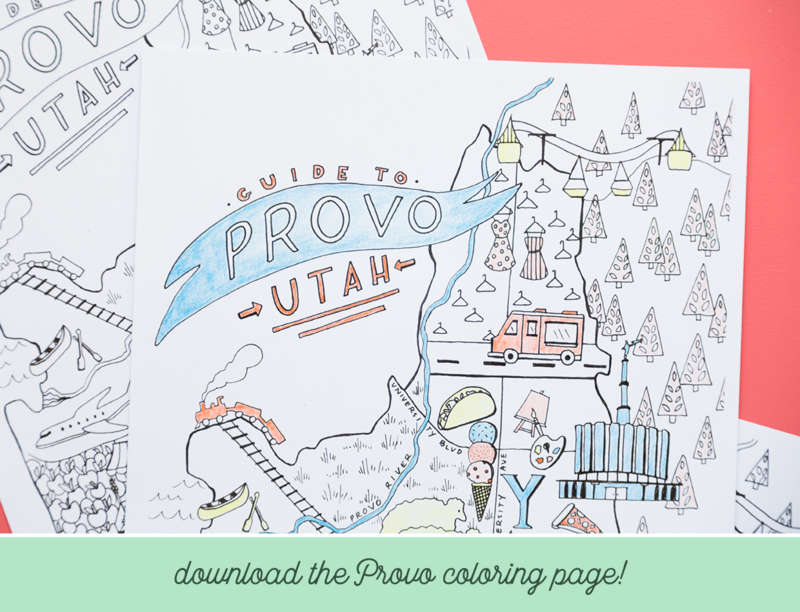 Provo is about 40 minutes south of Salt Lake City, and one of the last cities before you travel south down to the national parks and further south. For that reason, it’s another popular stop along the way. Being a university, there’s more diversity than you’d expect and a lot of interesting people. I’ve found that a lot of people are moving here from all ways of life and I love that it feels more and more diverse. After living in major cities for the last decade before moving here, I was expecting it to feel more small town and I’m so pleased with the direction it’s going. There’s more and more rad things to do and people are really latching onto it and making it their own. Many of the residents here are, as you might expect, Mormon and with that comes a lot of unique living patterns. For example, Mormons don’t drink alcohol so the preferred vice of choice is soda and sweets. Thus, a thriving soda and sweets scene is prevalent. Never heard of such a thing? Neither had I! But the NY Times caught hold of it when a lawsuit went down between two competing soda places. Food for thought. Pun intended. Lars Top 12. Warning: there’s a LOT of pizza choices. Mostly because they are the best ones and not necessarily because I only love pizza. Bruges. MY FAVORITE fries in the world. I love them. AND they come with various sauces for dipping (my favorites are the lemon pepper dill and greens). NOT TO MENTION, their delicious waffles. The Lars favorite: liege waffle, creme fraiche, and strawberries on Waffle Tuesday ($2 waffles). El Gallo Giro. I love me some Mexican and this is my favorite in the area. It’s authentic and they’ve got some delicious fresh juices (unlimited refills!). Communal is perhaps the only restaurant in the area where you’d go for a really nice meal. There aren’t too many options for a date night that’s not cafeteria style and this one is nice for the farm-to-table aspect. I find that they have a very stable menu, which means that we don’t go too often because it often feels like there’s not too much change. Their chicken is delicious. Black Sheep a fun spot for Native American/Mexican/Southwestern fushion. They’re known Navajo tacos but personally I love their hog jowl tacos and buffalo nickel burger best. Get their cactus pear lemonade for the whole table. Station 22 is a great place to bring out of towners because of the great ambiance. It’s a Southern-inspired cuisine and the decor reflects that. They’ve got a large selection of old-fashioned sodas, in true Provo fashion. Slab. I love Slab SO much. A “slab” is basically two pieces of pizza put together. I LOVE the rosemary potato bacon. I get it every time, but they have so many options that I should try. Cafe Rio is a Utah chain but there’s a reason it’s spreading. Two words: pork salad. Ginger’s Garden Cafe is located in Springville, just south of Provo. It’s right by our studio. It’s all healthy and good. Delicious smoothies. Plus, afterwards, you can take a yoga class. Good Thyme is a cafeteria style restaurant intended for work lunches, but it’s farm-to-table and good. Terra Mia pizza. Another delicious pizza place. Bombay House. It’s not my favorite Indian in the world, but most people around town think it’s the best. Treehouse Room at Sundance for a fancier meal. Brasas. Yummy Mexican. Plus, they let you try everything before you buy it. Foodtruck round up. All the food trucks in the area come together every Thursday. Fun vibe, although I wish they had more seating options. Kolaches. A Czech pastry that come in savory or sweet. CupBop. Korean bbq. Good for variety. Art City Trolley. Restaurant inside the iconic Springville trolley. Roll it up. I had a delicious experience there when they changed chefs last year. So delicous. Cubby’s. I love their tri-tip salad. Mountain West Burrito. They used to have one located closer to our house, and I thought that one was better. It just hasn’t felt the same since. Straptank Brewery. I haven’t actually been, but it’s brand new in Springville and I’ve heard good things. Plus, the building and vibe is rad. Provo Bakery. Fun local vibe. And good news, They take custom orders! Taste. It’s a new chocolate tasting shop. The interiors alone are worth the visit. It’s reminiscent of European cafes. Rockwell Creamery. Homemade ice cream. Try the mint chocolate chip (REAL mint!). Sweet Tooth Fairy. Yummy everything. Startup’s Candy factory. Utah is the land of chocolate covered cinnamon bears. They make theirs in milk AND dark chocolate. Open to the public. Pop n’ Sweets. Old time soda and candy from all over the world. Swig/Sodalicious. I’m not much of a soda fan (or anything with syrup) but locals love them. Which one is better? I have no idea. Try one of each and make the choice yourself. Mend Juicery. Delicious juices and popsicles. Sundance. I always take visitors to Sundance. It’s cozy and beautiful. They have zip lines, ski lift rides, skiing. Plus a number of workshops and classes. It’s beautiful. Sunriver Gardens. My favorite nursery in the area. Lovely plant collection and setting and fun gift shop. They even have workshops and such. Velour. Provo has a surprising number of successful bands that have made it big and they typically start here. Rooftop concert series. Every first Friday during the summer the city gathers to hear some of the best at this free concert. Foodtruck round up. Every Thursday. Provo farmer’s market. Every Saturday in Pioneer Park. Quarry Climbing. To be honest, I have NO experience with this. Ha! But maybe you’d like it. Hiking: Provo Canyon, Rock Canyon, Squaw Peak. Well, everywhere really. BYU MOA. I interned there in college! Great exhibitions and collection. Harmony classes. 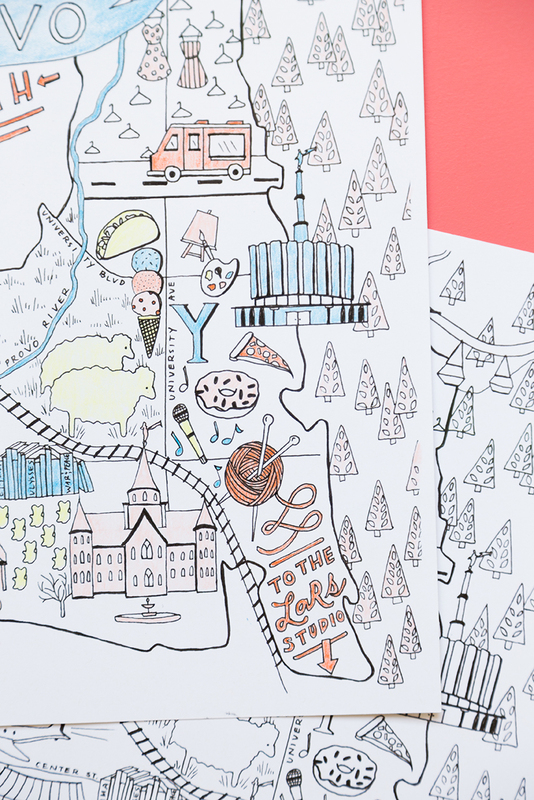 The best local craft classes. Beehive Bazaar, Bijou Market, 3 Dotters Vintage and other markets. Spread throughout the year. Look at their calendar to see when they are. Provo Beach Resort. It’s the closest thing we have to California. Springville Museum of Art. This is the site of my very first internship. I made the museum newsletter. It was my first exposure to InDesign. Riverwoods. If you need some retail therapy. Color Festival in Spanish Fork. Thanksgiving Point: Visit for tulip season! Stadium of Fire: Biggest 4th of July celebration in existence. At least it feels like it. It’s so closet to my house it’s a little too close for comfort. Provo City Center temple is brand new and beautiful. Lovely for a walk around. It used to be the old Provo Tabernacle and was burned down in 2011 and recently completed as an LDS temple. Provo temple. The older 60s temple. A peaceful walk around. Classic Fun Center. You know I’m all about the skating. Here’s where to go. Harmony. Great collection of artisanal fabrics, yarn, and gifts. Actual Source. Minimal design book shop and graphic design agency. Foxglove. Best local floral shop with fun gifts. Pioneer Books. Fun used book shop environment. Soel Boutique. Gifts for baby and mama. DI Provo. If you’re into thrifting! It’s organized by color! Savers Orem. Another thrift shop. Brambles and Blossoms. Beautiful gardening and home goods shop. Unhinged. Vintage and apparel shop complete with a barber shop inside. Cat’s Cradle antiques shop. WONDERFUL antiques shop. The owner goes all over the world to collect. Not cheap. BYU Store. Go for the chocolate covered cinnamon bears. They sell them by 1 pound bags. Alice Lane Wonderland. Home and designer gift shop at a good price. Asian Market 23 N 500 W. This is Paul’s favorite grocery store. There aren’t too many hotel situations in Provo. You have to go outside a bit for something really scenic and pretty. Washington School House Hotel. Ok, it’s not near Provo much, but it’s beautiful! Located in Park City. 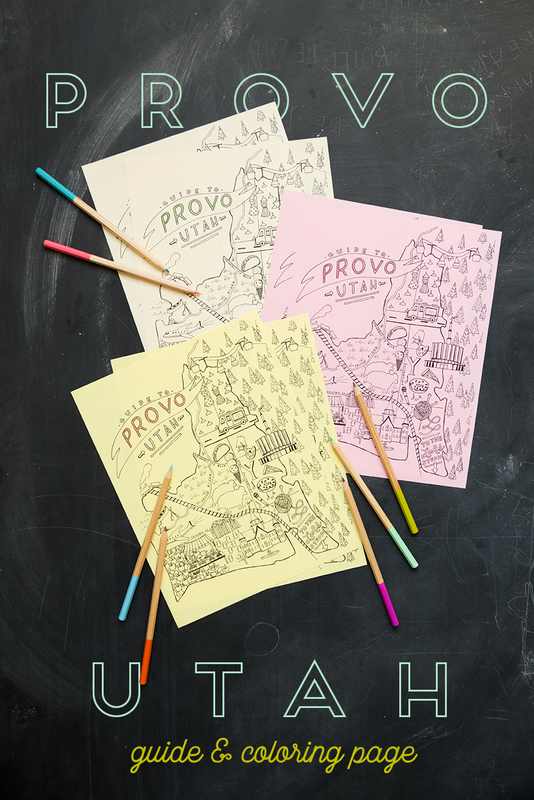 DOWNLOAD the Provo coloring page here. I’m sure I’ve missed some. What are YOUR favorites? 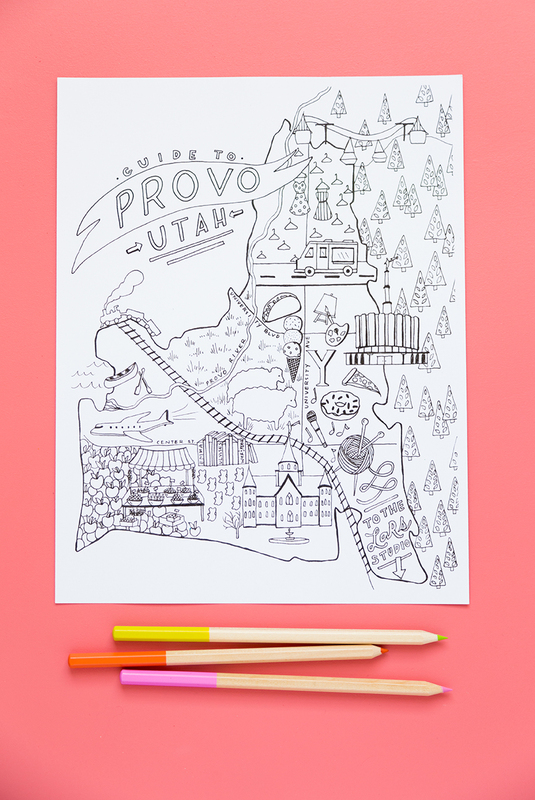 Stay tuned, I’ll be doing more city guides including nearby Utah cities like Salt Lake and Park City.